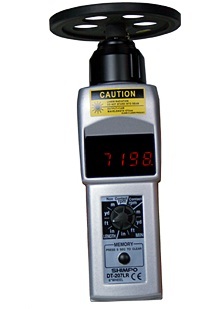 Incorporating the precise laser technology and user-friendly functions as our DT-207LR-S12 tachometers provide exceptional accuracy in measuring speed and length via a 12” wheel; the larger wheel rotates more slowly than a standard 6” wheel, enabling reliable and safe registration of high speeds. These superior instruments also feature a contact adapter, conveniently allowing both non-contact and contact measurement. One year warranty.